The military chief of the main umbrella group of Syrian rebels, the Free Syrian Army, has accused Hezbollah fighters of “invading” Syria in a BBC interview. Gen Selim Idriss claimed that more than 7,000 fighters of the Lebanese Shia movement were taking part in attacks on the rebel-held town of Qusair. The French foreign minister has estimated the number at 3,000-4,000. The US State Department has demanded that Hezbollah withdraw its fighters from Syria immediately. A spokeswoman Jen Psaki said their presence was an “extremely dangerous” escalation. The statements follow a meeting of the UN Human Rights Council in Geneva, which condemned government attacks on Qusair and the involvement of foreign fighters. He appealed for more weapons “to defend our citizens”. He said the FSA was fielding fewer than 1,500 fighters in the fight for Qusair, armed only with light weapons. More than 50,000 residents were trapped in the town and a “massacre” would occur if it fell, he added. He also said he had received information that Iranian fighters were involved in the offensive. Hezbollah fighters have been in Syria for some time now but their numbers appear to have grown rapidly over the last few weeks because of the intense fighting for control over the key town of Qusair, says the BBC’s Kim Ghattas in Washington. Ms Psaki called their presence “unacceptable” and demanded they leave. Washington has no leverage over Hezbollah and the warning did not come with a threat of any consequences if the Lebanese militant group does not withdraw, our correspondent says. But the statement is a sign of growing concern in the US that the conflict in Syria is morphing into a complex regional war by proxy. Asked about the presence of jihadist factions in the Syrian opposition, Gen Idriss said they formed “not more than 5-8% of all fighters in Syria” and that they had received excessive media coverage. However, he said that while he did not share jihadists’ ideology, he was not in a position to try to deter anyone who wanted to join the fight against President Bashar al-Assad’s regime. “When you are going to support us with weapons and ammunition, we can give you any kind of guarantee that you need that these weapons will go to the right hands,” he said. Gen Idriss also demanded that the Syrian opposition in exile stop internal wrangling and agree immediately to attend a peace conference scheduled for next month in Geneva. On Wednesday, Syrian state media claimed they had seized a key air base in the fight for Qusair. The Dabaa air base was seized after several hours’ fighting, according to Syrian military sources. Hezbollah’s al-Manar TV showed tanks being deployed inside the air base and soldiers in the base’s hangars. 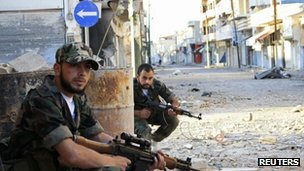 Fighting around Qusair has been raging for several days as government forces have mounted a fierce offensive to oust rebels from the town. Correspondents say Qusair is a strategic conduit for the rebels, through which weapons and fighters can be transported from Lebanon, about 10km (six miles) away. The town is also important for President Assad because it is located between Damascus and the Alawite heartland of the embattled government on the Mediterranean coast. And it is not far from the motorway linking the capital to the city of Homs. The vote at the UN Human Rights Council in Geneva on the use of foreign fighters in Qusair passed with 36 in favour, one against, and eight abstentions. The non-binding text condemned “the intervention of foreign combatants fighting on behalf of the Syrian regime” in Qusair. The Council also called for an urgent investigation into alleged abuses in Qusair. Syria’s key backer Russia called the resolution “odious”, but is not a voting member of the council this year. Only Venezuela voted against the resolution. Before the vote, UN High Commissioner for Human Rights Navi Pillay called on foreign powers to stop “emboldening” the belligerents by providing weapons on both sides of the conflict. “The message from all of us should be the same: we will not support this conflict with arms, ammunition, politics or religion,” she said in a statement.